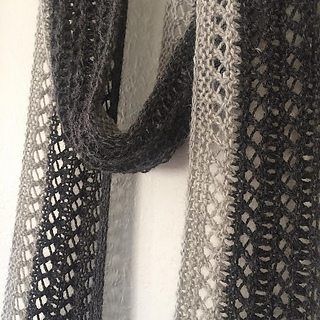 Lightsong is a textured scarf with a breezy fringe. Simple to knit and fully reversible, Lightsong shines in the natural colours of Adagio Mills Alpaca 8 ply. The pattern has been professionally tech. edited and test knitted, and contains a photo tutorial for the addition of the fringe. Lightsong is a companion pattern to Darksong, available at a discount as part of the Greysongs e-book. Sample shown in Adagio Mills Alpaca 8 ply ‘Stormy Grey’ and ‘Clouds’. Sample used 315 metres/345 yards, including fringe. Your gauge will affect the size of the finished scarf, as well as the amount of yarn you will use. If in doubt, stock up on extra.